A Temple is a huge symbolism; it involves a multiple sets of ideas and imagery. The temple is seen as a link between man and god; and between the actual and the ideal. As such it has got to be symbolic. A temple usually called Devalaya, the abode of God, is also referred to as Prasada meaning a palace with very pleasing aspects. Vimana is another term that denotes temple in general and the Sanctum and its dome, in particular. Thirtha, a place of pilgrimage is it’s another name. The symbolisms of the temple are conceived in several layers. One; the temple complex, at large, is compared to the human body in which the god resides. And, the other is the symbolisms associated with Vimana the temple per se, which also is looked upon as the body of the deity. And the other is its comparison to Sri Chakra. Let’s start with the temple complex being looked upon as a representation of Sri Chakra. The shrine is itself an object of reverence. The icon at the center of the temple is the image of divinity and its purity that generations after generations have revered and venerated. That image residing at the heart of the temple is its life; and is its reason. One can think of an icon without a temple; but it is impossible to think of a temple without an icon of the divinity. The very purpose of a temple is its icon. And, therefore is the most important structure of the temple is the Garbagriha where the icon resides. There are also views that assert saying that the temple has a sanctity of its own , independent of the icon; and, the icon’s sanctity is related to that of the temple . This view is based on the premise that even before the icon is placed within it, the temple-structure , is indeed sacred as its womb (Grha-garbha); and, the sanctum becomes the Gabha-griha (womb-house) only after the icon is installed within it. The temple (ayatana , the abode) and the image of the divinity placed within it are, thus, mutually complimentary. In fact, the entire temple is conceived as the manifestation or the outgrowth of the icon. And, very often, the ground-plan of a temple is a mandala. Just as the Sri Chakra is the unfolding of the Bindu at its centre, the temple is the outpouring or the expansion of the deity residing in Brahmasthana at the centre. The temple as also the Sri Chakra employs the imagery of an all – enveloping space and time continuum issuing out of the womb. In the case of Sri Chakra the Bindu is the dimension-less and therefore imperceptible source of energy. The idol, the Vigraha, in the Garbagriha represents the manifestation of that imperceptible energy or principle; and it radiates that energy. The devotee- both at the temple and in Sri Chakra- moves from the gross to the subtle. In the temple, the devotee proceeds from the outer structures towards the deity in the inner sanctum, which compares to the Bindu in the Chakra. The Sri Chakra upasaka too proceeds from the outer Avarana (enclosure) pass through circuitous routes and successive stages to reach the Bindu at the centre of the Chakr, representing the sole creative principle. Similarly the devotee who enters the temple through the gateway below the Gopura (feet of the Lord) passes through several gates, courtyards and prakaras, and submits himself to the Lord residing in the serenity of garbhagrha, the very hearts of the temple, the very representation of One cosmic Principle. The other symbolism is that the human body is a temple in which the antaryamin resides. 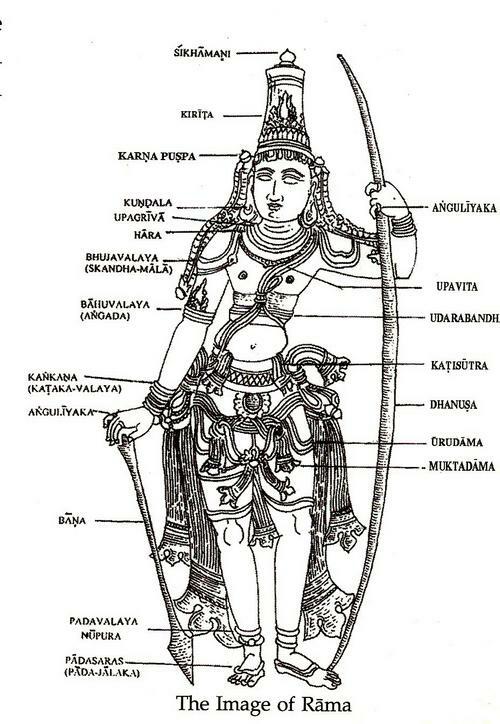 The analogy is extended to explain the various parts of the body as being representations of the aspects of a temple. In this process, the forehead is said to represent the sanctum; and the top of the head, the tower. The space between the eyebrows, the ajna chakra, is the seat of the divinity. The finial of the tower is the unseen the sahasrara located above the head. Accordingly, the sanctum is viewed as the head; and Right on top of that head is the passage through which the currents of life ascend to the tower through that stone slab Brahma-randra_shila. Around the four corners of this slab are placed the images of the vehicles or emblems that characterize the icon inside the sanctum. Another interesting aspect is that the temple concept is a curious mixture of Vedic, Tantric and Agama principles. 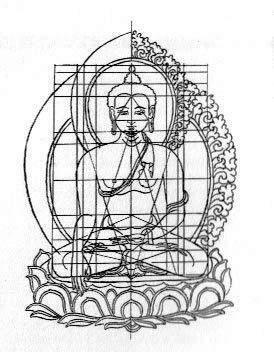 The Tantra regards the human body as a Mandala; and it is mobile (chara or jangama) Mandala. The Agama shastras regard a temple too as Mandala; and here it is an immobile (achala or sthavara) Mandala. The analogy of the temple with the human body finds closer relationships. The symbolism extends to the conception of Vimana or the central part of the temple as the physical form of god. For instance, the sukanasi or ardhamantapa (the small enclosure in front of the garbhagrha) is the nose; the antarala is the neck; the various mantapas are the body; the prakaras are the hands and so on. Vertically, the garbhagrha represents the neck, the shikhara (superstructure over the garbhagrha) the head, the kalasha (finial) the tuft of hair (shikha) and so on. 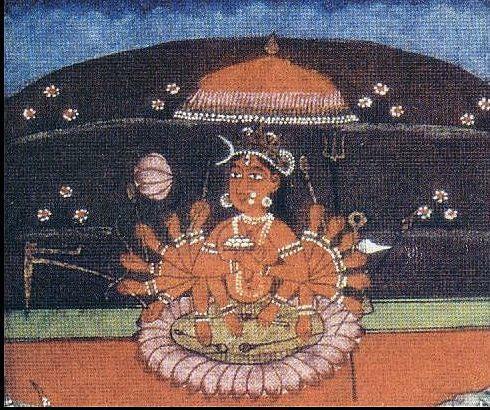 The names assigned to various parts of the Vimana seem to go along with this symbolism. For instance, Pada (foot) is the column; jangha (trunk) is parts of the superstructure over the base; Gala or griva (neck) is the part between moulding which resembles the neck; Nasika (nose) is any nose shaped architectural part and so on. The garbhagrha represents the heart and the image the antrayamin (the indwelling Lord). These symbolisms also suggest seeking the divinity within our heart. The temple is also seen as a representation of the subtle body with the seven psychic centres or chakras. In the structure of the temple, the Brahma randra is represented in the structure erected on top of the sanctum. The flat-roof (kapota) of the sanctum is overlaid by a single square stone slab known in the texts as Brahma-ranhra-sila (the stone denoting the upper passage of life). The sanctum is viewed as the head; and right on top of the head is the passage through which the currents of life ascend to the tower through this stone slab. The other symbolisms associated with the Sanctum and the tower above it are, that sanctum is the water (aapa) principle and the tower over it is Fire (tejas); the finial of the tower (Vimana) stands for air (vayu) and above the Vimana is the formless space (akasha). The sanctum is thus a constellation of the five elements that are basic to the universe. And fire being the active element that fuses the others, the tower becomes an important limb in the structure of a temple. Before we deal with iconography per se , let’s briefly go-over some its general principles associated with it . The idea of multiple forms of divinity was in the Vedas. Rig Veda at many places talks in terms of saguna, the supreme divinity with attributes. The aspects of the thirty-three divinities were later condensed to three viz. Agni, the aspect of fire, energy and life on earth; Vayu, the aspect of space, movement and air in the mid-region; and Surya the universal energy and life that sustains and governs all existence, in the heavenly region, the space. This provided the basis for the evolution of the classic Indian trinity, the Brahma, Shiva and Vishnu. The concept of polytheism gave tremendous impetus to all branches of Indian arts, literature and iconography. The polytheism is, in fact, the lifeblood of iconography; for it is only through a divinity with aspects one can represent and worship ones ideal with love, adoration and earnestness. Making an image involves an understanding of its attributes, virtues, powers, characteristics, symbols and its disposition. An image is the visual and concrete form of idealism; the idioms of beauty grace and power nurtured and honed by generations after generations. It is a representation of a community’s collective aspirations. Not all divine representations are made through icons. Shiva is represented usually by a conic linga or an un-carved rock ; Vishnu and Narasimha are worshipped at homes as Saligrama (a special types of smooth dark stones found on bed of the Gandaki river); Ganapathi is best worshipped in the roots of the arka plant, and he is also represented by red stones (sona shila) or turmeric cones or pieces (haridra churna). The Devi in Kamakhya temple is worshipped in a natural fissure of a rock. Yet all these divinities have specified well defined iconographic forms. Since the very purpose of the temple structure is the image residing in it; and the temple is regarded the virtual expansion of the image, let us talk for a while about temple iconography. Iconography, in general terms, is the study and interpretation of images in art. But, in the context of this discussion it could be restricted to the study of icons meant for worship and the images used in temple architecture. The temple iconography is more concerned with the concept, interpretation and validity of the icon in terms of the themes detailed in the scriptures or the mythological texts; and with the prescriptions of the shilpa shastra. There is not much discussion on the styles of architecture or the art forms, per se. Besides the agamas, there are several texts that detail the processes involved in practicing the art; and specify the rules governing iconography and iconometry. The Brihat Samhita of Varahamihira (6th century AD) is an ancient text that provides descriptions of certain images. It refers to one Nagnajit, as the author of a contemporary work on Silpasastra – but not much is known about him or his work. Shukranithisara is another treatise which discusses aspects such as the proportions and the measurements recommended for the images of various classes and attributes. The subject he dealt with has since developed into Iconometry. 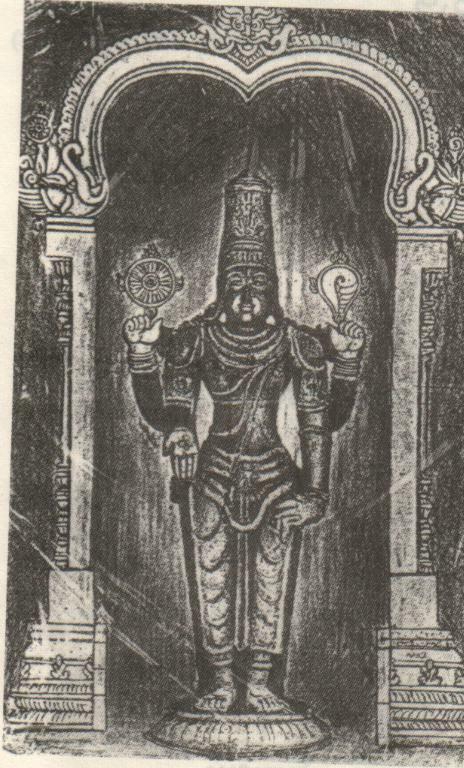 Someshwara’s (a 1th century western Chalukya king) Abhilashitartha Chintamini contains interesting iconographical details of many important deities. And, Hemadri (13th century AD) who hailed from Dakshina Kannada region authored Caturvarga_chintamini, which deals with temple architecture and construction. He is credited with introducing a method of construction that did not use lime. In addition, there are the major and authoritative texts that deal comprehensively with all aspects of Devalaya Vastu. These include Kashyapa shilpa samhitha, Mayamata, Manasara, Shilpa rathna, Kumaratantra, Lakshana_samuchayya, Rupamanada; and the Tantrasara of Ananda Tirtha (Sri Madhwacharya) , which contains sections dealing with the study of images (iconography and iconometry). Among the puranas, the Agnipurana details the Prathima_lakshanam (the characteristics of images), Prathimavidhi (the mode of making images), and Devagraha nirmana (the construction of places of worship). Similarly, the Matsya Purana (dated around second century AD) has eighteen comprehensive chapters on architecture and sculpture. This purana mentions as many as eighteen ancient architects (vastu_shatropadeshkaha): Brighu, Atri, Vashista, Vishwakarma, Brahma, Maya, Narada, Nagnajit, Visalaksa, Purandara, Kumara, Nanditha, Shaunaka, Garga, Vasudeva, Aniruddha, Shuka and Brihaspathi. Many of these names appear to come from mythology; but quite a few of them could be historical. Sadly, the works of most of these savants are now lost. The Mathsya purana says that the best aspect of karma yoga is the building temples and installing deities; and therefore devotes several chapters to the subject of temple construction and image making. The Vishnu purana (dated about 3rd century AD) too contains several chapters on the subjects of architecture and sculpture. Further, it includes the Vishnu_dharmotthara_purana (perhaps an insertion into the Vishnupurana at a later period), which is a masterly treatise on temple architecture, iconography and painting. This work which is in the form of a conversation between the sage Markandeya and the King Vajra is spread over 42 chapters. In part three of the text there is virtually a catalouge of the various deities with descriptions of their features, stance and gestures (mudras) apart from their disposition and attributes. In addition to the Sanskrit texts, the Tamil works – Mandalapurusha’s Chintamini Nigandu and Sendanar’s Divakara nigandu, are well known and widely accepted. Besides, there is an ancient work by an unknown author, Silpam (perhaps a translation of an ancient Sanskrit text), which is popular among the shilpis. A special mention needs to be made about iconography ‘s (prathima lakshana) relation with Natyasastra. The Shilpa and Chitra (painting) are closely related to Natyasastra (ca. second century BCE). The rules of the iconography (prathima lakshana), in particular, appear to have been derived from the Natyasastra. 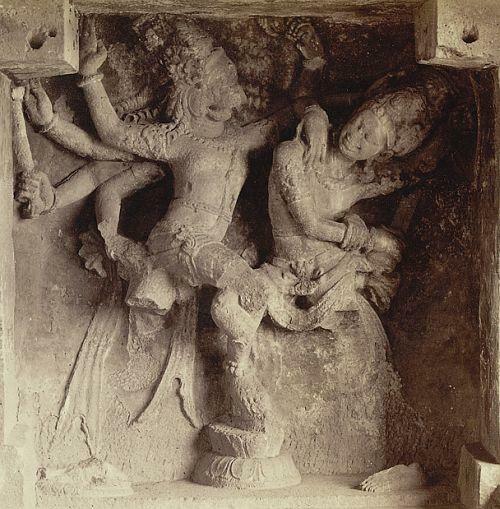 The Indian sculptures are often the frozen versions or representations of the gestures and poses of dance (caaris and karanas) described in Natyasastra. The Shilpa (just as the Natya) is based on a system of medians (sutras), measures (maanas), postures of symmetry (bhangas) and asymmetry (abhanga, dvibhanga and tribhanga); and on the sthanas (positions of standing, sitting, and reclining). The concept of perfect symmetry is present in Shilpa as in Nrittya; and that is indicated by the term Sama. The Natya and Shilpa sastras developed a remarkable approach to the structure of the human body; and delineated the relation between its central point (navel), verticals and horizontals. It then coordinated them, first with the positions and movements of the principal joints of neck, pelvis, knees and ankles; and then with the emotive states, the expressions. Based on these principles, Natyasastra enumerated many standing and sitting positions. These, demonstrate the principles of stasis, balance, repose and perfect symmetry; And, they are of fundamental importance in Indian arts, say, dance, drama, painting or sculpture. The demonstrations of those principles of alignment could be seen in the sama-bhanga of Vishnu, Shiva, abhanga of Kodanda-Rama and tribhanga of Nataraja; and in the vibrant movements of dance captured in the motifs carved on the walls of the Indian temples depicting gandharvas, kinnaras, vidyadharas and other gods and demigods. If the saala bhanjikas (bracket figures) recreate the caaris(primary movements) , the flying figures recreate the karanas (larger movements).The representations of about one hundred and eight of the karanas described in the Natyasastra find expression on the walls of temples spread across the country. It is as if the rich and overpowering passages of Natyasastra are translated in to stone and published on temple walls. For the purpose of creating an image , initially, a square grid is divided into sixteen equal squares . 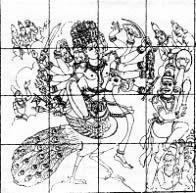 These squares are grouped into six segments : Brahma -bhaga ( the central four squares) ; Deva -kesha or Deva shiro-alankara -bhaga ( two squares on top of Brahma-bhaga for depicting the crown or elaborate hair arrangement) ;Vahana-bhaga or peeta-bhaga ( space for pedestal – two bottom squares , below the Brahma-bhaga);Bhaktha -bhaga ( two bottom sqares on either side of Peeta -bhaga for locating images of the worshipping devotees); Devi-bhaga ( two squares each on either side of Brahma-bhaga for the accompanying female deities) ; and Gandharva-bhagha (two squares in the top on either side of Shiro-bhaga for depicting the Gandarvas). 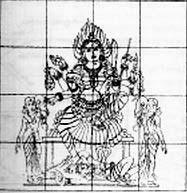 The image of the main deity along with that of the consorts and subsidiary figures are located within the square grid. The central part of the main deity is accomodated in the Brahma-bhaga; its head or crown or hair-do is figured in the Deva-shiro-bhaga, while the f eet of the deity, the pedastal and the mount (vahana) are in the lower vahana-bhaga. The verticle and horizontal axis of the square as also its diagonal axis of the square pass through what is known as the Brahma-bindu right at the centre of the Brahma-bhaga. It is at the Brahma-bindu the navel (nabhi) of the deity would be located. All other image parts are co-related to the Brahma-bindu. One of the main resources for a practicing shilpi is the collection of Dhyana shlokas. Before a shilpi starts on a project to sculpt an image, he needs to be clear in his mind on its form, its aspects, its countenance, the details of its physiognomy, its facial and bodily expressions; its posture, details of the number of arms, heads and eyes; and details of its ornaments, ayudhas (objects it holds in its hands) etc. For this purpose, the Shilpis generally refer to a wonderful collection of most amazingly articulate verses called Dhyana Shlokas, the verses in contemplation. These verses culled from various texts of Shipa Shastra, the Agamas and the Puranas; and also from Buddhist and Jain texts, describe, precisely, the postures (dynamic or static, seated or standing), the Bhangas (flexions – slight, triple, or extreme bends), Mudras (hand gestures), the attitudes, the nature, the consorts and other vital details of each aspect that provides the deity with power and grace. it is said that there are about 32 aspects or forms of Ganapathi, 16 of Skanda, 5 of Brahma, 64 of yoginis, and innumerable forms of Vishnu, Shiva and Devi .Each one of those forms has a Dhyana shloka illustrating its aspects and attributes. Dhyana shlokas are more than prayers or hymns; they are the word-pictures or verbal images of a three-dimensional image. 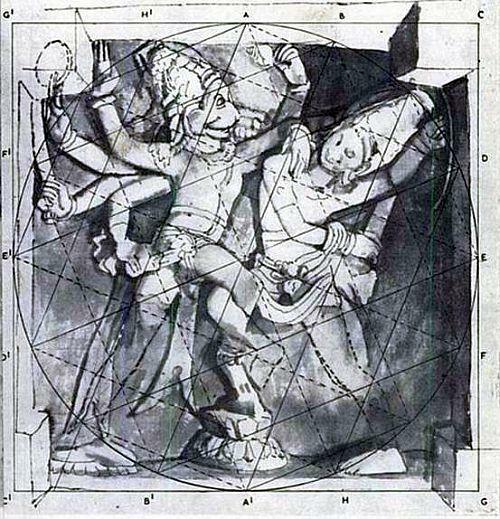 They help the Shilpi to visualize the deity and to come up with a line drawing of the image. It is said that there are more than 2,000 such Dhyana shlokas. How this collection came to be built up over the centuries is truly amazing. These verses have their origin in Sanskrit texts; and the scholars who could read those texts knew next to nothing about sculpture. The Shilpis who actually carved the images had no knowledge of Sanskrit and could not therefore read the texts or interpret the shlokas. This dichotomy was bridged by the generations of Shilpis who maintained their own set of personal notes, explanations and norms; as also references to shlokas; and passed them on to their succeeding generations and to their disciples. Thus, among the many traditions (parampara) inherited in India, the tradition of Vishwakarma is unique. The mode of transmission of knowledge of this community is both oral and practical. The rigor and discipline required to create objects that defy time and persist beyond generations of artists, has imbued this tradition with tremendous sense of purpose, and zeal to maintain purity and sensitivity of its traditions; and to carry it forward. This has enabled them to protect and carry forward the knowledge, the art and skills without falling prey to the market and its dynamics. With the emergence of the various academies of sculpture and organized efforts to collate and publish the old texts with detailed explanations, there is now a greater awareness among the shilpis of the present day. Yet, the neglect of Sanskrit and inability to read the texts in Sanskrit is still an impediment that badly needs to be got over. Please look at the summary of a few Dhyana shlokas. 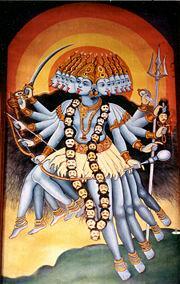 The image of Lord Narayana must be made with ten , eight, four or two arms. His head should be in the form of an umbrella, his neck should be like counch, his ears like sukthi, he should have high nose, strong thighs and arms. His breast must bear the Srivatsa mark and be adorned with the Kaustubha gem. He should be made as dark as the Atasi (Linum usitatissimum), clad in yellow robes, having a serene and gracious countenance. He should be wearing a diadem and ear-rings. Of the eight hands the four on the right side must have the sword(nandaka), mace(kaumodaki), arrow and abhaya _hastha, mudra of assurance and protection (the fingers raised and the palm facing the devotees), and the four on the left side, the bow(saranga), buckler, discus (sudarshana) and conch (panchjanya). In case the image is to have only four arms, the two hands on the right side will display the abhaya mudra or lotus; and discus respectively. And, in his hands in the left, he holds the conch and mace. And, in case he is made with only two arms, then the right hand bestows peace and hope (shanthi-kara-dakshina hastha) and the left holds the conch. This is how the image of the Lord Vishnu is to be made for prosperity. When Vishnu is two armed and carries discus and mace, he is known as Loka-paala-Vishnu. Surya, the Sun-God should be represented with elevated nose, forehead, shanks, thighs, cheeks and breast; he should be dressed in robes covering the body from breast to foot. His body is covered with armor. He holds two lotuses in both of his hands, he wears an elaborate crown. His face is beautified with ear-rings. He has a long pearl necklace and a girdle round the waist. His face is as lustrous as the interior of the lotus, lit up with a pleasant smile; and has a halo of bright luster of gems (or, a halo that is made very resplendent by gems on the crown). His chariot drawn by seven horses has one wheel and one charioteer .Such an image of the Sun will be beneficial to the maker (and to the worshipper). The dhyana shloka preceding the middle episode of Devi Mahatmya gives the iconographic details of the Devi. The Goddess is described as having eighteen arms, bearing string of beads, battle axe, mace, arrow, thunderbolt, lotus, bow, water-pot, cudgel, lance, sword, shield, conch, bell, wine-cup, trident, noose and the discuss sudarsana. She has a complexion of coral and is seated on a lotus. The Mahakali is “Wielding in her hand the sword, discuss, mace, arrow, bow, iron club, trident, sling, human head, and conch, she has three eyes and ornaments decked on all her limbs. She shines like a blue stone and has ten faces and ten feet. That Mahakali I worship, whom the lotus born Brahma lauded in order to slay Madhu and Kaitaba when Hari was asleep”. The images in the Hindu temples can be classified into three broad groups: Shaiva, Shakta and Vaishnava, representing the three cults of Shiva, Shakti and Vishnu, respectively. The images in the temple could be achala (immovable) Dhruva-bimba or dhruva-bera; and chala(movable). The chala bera, usually made of pancha loha (alloy of five metals), are meant for other forms of worship and ceremonial services. The dhruva-bera is the immovable image of the presiding deity of the temple and resides in the sanctum and to which main worship is offered (archa-murti). It is usually made of stone. In a temple following the Vaikhanasa tradition, the immovable (dhruva-bera) represents the primary aspect of the deity known as Vishnu (Vishnu-tattva). The other images in the temple that are worshipped each day during the ritual sequences are but the variations of the original icon (adi-murti). These other forms are emanations of the main idol, in successive stages. And, within the temple complex, each form is accorded a specific location; successively away from the Dhruva bera. 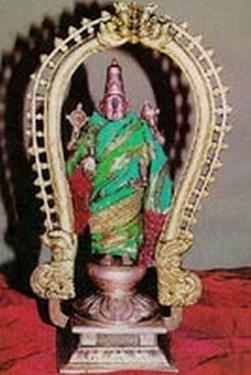 :- Kautuka –bera is a mini replica of the main idol (usually madeof gems, stone, copper, silver, gold or wood and about 1/3 to 5/9 the size of the Dhruva-bera), and is placed in the sanctum near the main idol and is connected to it by a metal string or silk thread. It receives all the daily worship(nitya-archana) including those of tantric nature. :- The next is the Snapana-bera (usually made of metal and smaller than Kautuka) which receives ceremonial bath (abhisheka) and the occasional ritual- worship sequences(naimitta-archana). :- The third is the shayana-bera, to which the services of putting the Lord to sleep are offered. :- The fourth is the Uthsava (always made of metal); is meant for taking the idol out of the temple premises on ceremonial processions. :- The fifth idol is Bali – bera ( always made of shiny metal) taken out , daily , around the central shrine when food offerings are made to Indra and other devas, as well as to Jaya and Vijaya the doorkeepers of the Lord ; and to all the elements. To this, sometimes another icon is added for daily worship, special rituals, and processions and for food-offering, it is known as Bhoga-bera. These five forms together make Pancha bera or Pancha murti. But, these different icons are not viewed as separate or independent deities; but are understood as emanations from the original icon, Dhruva–bimba. According to Vyuha -siddantha of the Agamas, the dhruva bera which is immovable represents Vishnu (Vishnu-tattva); and it symbolizes Para, the transcendent one (Vishnu). The kouthuka is bhoga (worship idol) representing purusha (personification of the Supreme), Dharma and Vasudeva. The snapana is ugra (fearsome aspect) represented by Pradyumna or Achutha. The uthsava bera is vaibhava (the resplendent) representing Jnana (knowledge), truth (Sathya) and Sankarshana. And, the Bali bera is antaryamin (one who resides within) representing Vairagya (spirit of renunciation) and Aniruddha. And again it is said, Purusha symbolized by Kautuka-bera is an emanation of the Dhruva-bera. Satya symbolized by Utsava-bera emanates from Kautuka-bera. Achyuta symbolized by Snapana-bera emanates from Utsava-bera. And, Aniruddhda symbolized by Bali-bera emanates from Bali-bera. The symbolisms associated with the four murtis (chatur-murti) are many; and are interesting. The four are said to compare with the strides taken by Vishnu/Trivikrama. The main icon represents Vishnu who is all-pervasive, but, does not move about. When the worship sequences are conducted, the spirit (tejas) of the main idol moves into the Kautuka,-bera, which rests on the worship pedestal (archa-pitha). This is the first stride of Vishnu.Again, at the time of offering ritual bath, the tejas of the main idol moves into the Snapana-bera which is placed in the bathing-enclosure (snapana –mantapa). 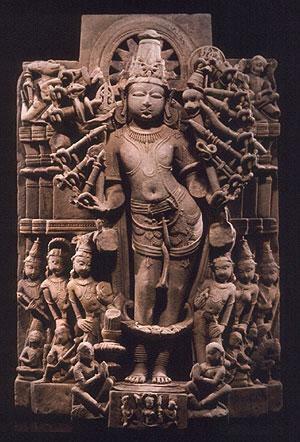 This is the second stride taken by Vishnu. And, the third stride is that when the Utsava-bera is taken out in processions. This is when the tejas of the Main idol reaches out to all. 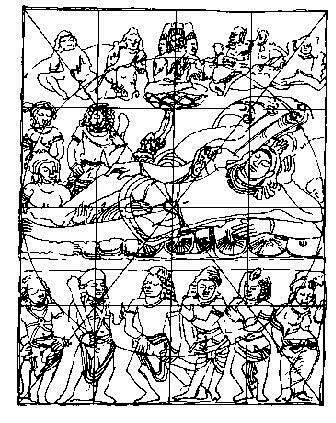 In Marichi’s Vimana-archa-kalpa the five forms, five types of icons, the pancha-murti (when Vishnu is also counted along with the other four forms) are compared to five types of Vedic sacred fires (pancha-agni): garhapatya; ahavaniya; dakshinAgni; anvaharya; and sabhya. These in turn are compared to the primary elements (earth, water, fire, air, and space). And, the comparison is extended to five vital currents (prana, apana, vyana, udana and samana). Further it is explained; the Vaikhanasa worship-tradition retained the concept of Pancha-Agni, but transformed them into five representations of Vishnu (pancha –murthi): Vishnu, Purusha, Satya, Achyuta and Aniruddha. And, that again was rendered into five types of temple deities as pancha-bera: Dhruva, Kautuka, Snapana, Utsava and Bali. Let us, for instance, take the case of the idols in the shrine on the hills of Tirumala. The practices at the Tirumala temple are slightly at variance with the standard procedures, perhaps because the temple predates most of the other temples in South India and that it has a tradition of its own. The dhruva bera at the Tirumala shrine is of course the magnificent and most adorable image of the Lord made of hard-black-stone; and has a recorded history of about two thousand years. 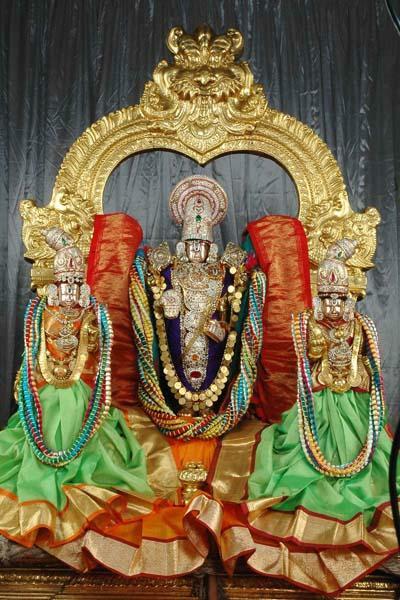 He is addressed as Sri Venkateswara, Sri Srinivasa and by host of other names. (Let’s talk more about the dhruva bera, towards the end of this post). 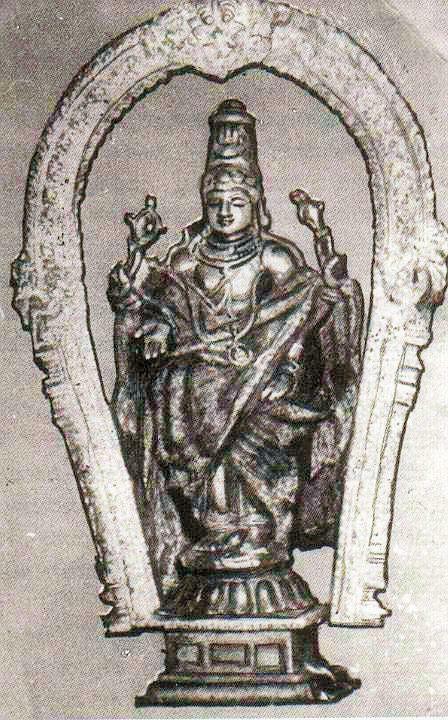 It is said that around the year 614 AD, the Pallava Queen, Devi Samavai (also known as Kadavan-Perundevi), donated an almost (but not exact- as it holds the Sanka and Chakra ) replica of the dhruva bera, made of silver. In terms of the Agama texts, this image is called kouthuka bera; but in the Tirumala shrine it is called Bhoga Srinivasa., In Tirumala , the kauthuka serves as snapana bera too (that is, the one to which ceremonial bath service is rendered). This image has come to be known as Bhoga srinivasa; perhaps because the other services such as the daily ceremonial bath and Ekantha seva that are due to the dhruva _bera are rendered to it. There is a six cornered Vaishnava chakra (mandala)- in the shape of two inter placed equilateral triangles – placed at the foot of the kauthuka, representing the six virtues of knowledge (jnana), abundance (Aishvarya), power (shakthi), strength (bala), resplendence (tejas) and valor or virility (veeerya). The kauthuka is placed right in front of the Lord’s foot stool (paada pitha) and is linked to the dhruva_bera through a string with strands of gold, silver and silk. It is ever linked to the dhruva bera and is never brought out of the antarala (bangaru vakili). For that reason it is also addressed as sambhandha-sutra-kauthuka-murthy. The Uthsava_bera at Tirumala shrine is named Malayappan, the earliest reference to which is found in an inscription dated 1369 AD. This idol might have entered into the temple regimen with the rise of the Pancharathra School of worship. Malayappan is a very skillfully crafted, beautiful image, made of panchloha, standing three feet tall on a pedestal of fourteen inches. It does not greatly resemble the dhruva_bera. Yet, it has a very pleasing disposition and is modestly ornamented. His consorts Sridevi and Bhudevi (of about twenty-nine inches height) are on his either side. All services, processions and celebrations conducted outside the sanctum are rendered to Malayappan. The Bali bera in Tirumala shrine is addressed as Koluvu srinivasa. After the rendering the ceremonial food service to the dhruva_bera, offerings are made to the bali_bera who accepts it on behalf of the basic elements in nature , the host of spirits guarding the temple and other minor deities. A unique feature of the bali_bera in Tirumala shrine is that, it seated on a golden throne placed in Snapana Mandapam, presides over the formal court summoned at the commencement of the day, where the day’s almanac is read out, and where the accounts of the previous day’s collections at the Srivari hundi are submitted. This is done is Snapana Mandapam before the dusk ;and, in Ghanta Mandapam after dawn. The traditional distribution of the daily remuneration, in the form of food grains and provisions, to the temple priests and attendant staff takes place in the presence of koluvu_srinivasa. It is not clear how this practice came into being at Tirumala. The other bera in the Tirumala temple is the Ugra Srinivasa, which apart from the dhruva bera is perhaps the oldest idol in Tirumala shrine. But, it has a rather sad history. The earliest reference to this idol is in an inscription dated 10th century. Ugra Srinivasa was used as the Uthsava murthy till about 1330 A.D, when a fire broke out in the temple; and thereafter it was replaced by Malayappan. The Ugra Srinivasa no longer serves as the uthsava bera and it is never bought out of the temple after sunrise; except on a single occasion in a year (utthana dwadasi in karthika month-Kaisika Dwadasi ) that too well before the sunrise. It is feared that if the sunrays touch the idol, it would spark fire in the temple premises. There are no known descriptions or specifications of the iconography of the Sri Venkateshwara idol in any texts of the Shilpa shastra. Till about the Vijayanagar period there were no temples of Sri Venkateshwara, outside Tirumala, Tirupathi and Mangapura regions. The idol does not also fall within the interpretations of any of the known schools of architecture such as Pallava, Chalukya, and Chola etc. That might be because the image of Sri Venkateshwara predates all such schools. 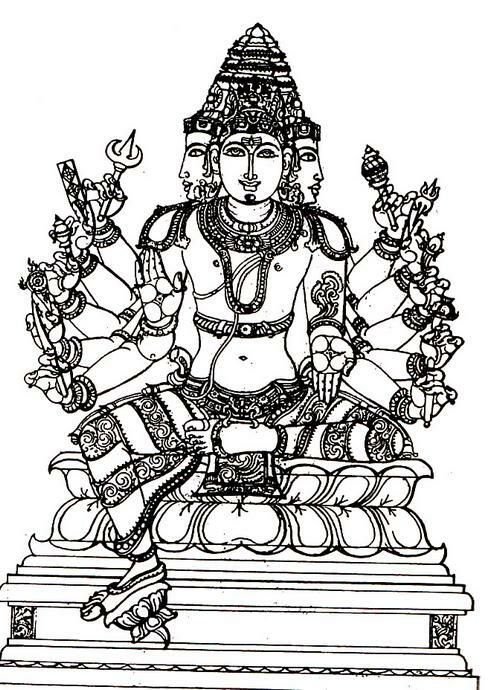 The sanctum at Tirumala is eka murthy griha a sanctum housing a single deity; Sri Vekateshwara is standing alone, not accompanied by his consorts. The icon is made of hard- black – polished stone (often described as saligrama shila) .Though the precise measurements of the image of the deity cannot be ascertained, it is said, it stands more than six feet in height, with the Kirita , the crown, measuring about twenty inches high; and the idol is mounted on a pedestal of about eighteen inches. The pedestal with lotus motif is almost at the ground level. The total height of idol is estimated to be a little more than eight feet (A person of normal height with arms raised just falls short of reaching the top of the idol’s crown) . The idol, crafted with great skill, is wonderfully well proportioned and is very pleasing to look at. It has four arms though its two upper hands are always kept covered (for whatever reason). Of the other two hands, the right hand is in Varada mudra, in a posture of benediction, blessing the devotees. The left hand is almost near the left knee in Katyavalambita mudrawith the thumb almost parallel to the waist, as if to assure that the mire of the samsara , the mundane existence , is only knee deep for those who submit to him and seek salvation. Let’s discuss some specific forms of iconography in the next segment.